The legendary gig that Joe Strummer, singer from the punk rock band The Clash, attended and inspired his writing their classic “White Man In Hammersmith Palais” took place on the June 5th,1977. At the Hammersmith Palais venue on Shepherd’s Bush Road W6, London during the height of punk mania. 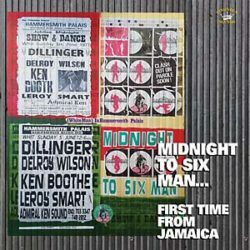 The full line-up for the show were all Jamaican artists Dillinger, Leroy Smart, Delroy Wilson (all the first time from Jamaica), and Ken Boothe. “Ken Boothe for UK pop reggae” who had already scored some hits with “Everything I Own” and “Crying Over You” in 1974. Joe Strummer was expecting roots, rock, reggae but the sound system that evening Admiral Ken Sound was playing “Four Tops All Night” as in soul and northern soul that were staple crowd pleasers at the time to warm up the audience, but in Joe’s eyes the music should have reflected more Jamaican roots-based music. The song also deals with bigger issues of black and white unity, but some people including the punk rockers. The artwork supplied by punk artist Mal-One has used the two posters that were made for this gig, the reggae promoters “Star Promotions” poster, that contained a picture of Ken Boothe and the venue’s own poster that used text to announce its line up for that evenings performance. Alongside these lost relics he has also combined the groups own poster for the “White Man In Hammersmith Palais” single that incorporated the use of rifle target sights, perhaps enhancing the air of violence contained in the songs message. Mal-One has collaged these together joining the two stories as indeed the song lyrics reflected. People often forget that the songs release was in fact as year after the actual gig, Kingston Sounds have tied this release to the 40th anniversary of the song’s release. Joe Strummer was one of the few voices from the punk era that used his lyrics as a weapon to tell the events that were happening around him and their relevance to those times. The song itself was released on June 16th, 1978. Kingston Sounds have compiled this album with songs by these artists, most of which you would have heard that night. Features artists from the full line-up of the show: Delroy Wilson, Leroy Smart, Ken Boothe, and Dillinger. CD version includes four bonus tracks.